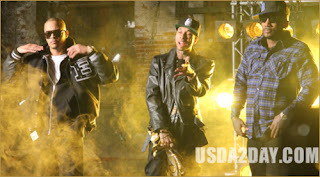 The Maguire: Tyga – Rack City (rmx) ft. Wale, Fabolous, Meek Mill, Young Jeezy & T.I. Tyga – Rack City (rmx) ft. Wale, Fabolous, Meek Mill, Young Jeezy & T.I. What a combination of rappers. If you dont at least give this track a listen, you might be crazy. NEW MUSIC :: Kid Ink - "Time Of Your Life"
NEW MUSIC :: Crooked I - "LA Leakers Freestyle"
NEW MUSIC :: Ace Hood - "Lord Knows"
NEW MUSIC :: XV - "End Of The World"